The game can be played on any turfed area such as public parks, gardens etc. for recreational purpose. All that needs to be done is to mark boundaries for the playing area described as ‘Gates’, ‘Tee Box’, ‘Fairway’ and ‘Green’. Each Gate shall consists of a ‘Tee-off’ area, ‘Fairway’ and end at a ‘Green’ where the gate is located. Generally fairway distances are between 40 metres to 130 metres depending on the par rating of the Gate. Width of fairways must be a minimum of 3 metres and no more than 10 meter where the fairway turns at a ‘dog-leg’ the landing zone should be wider (10 metres). 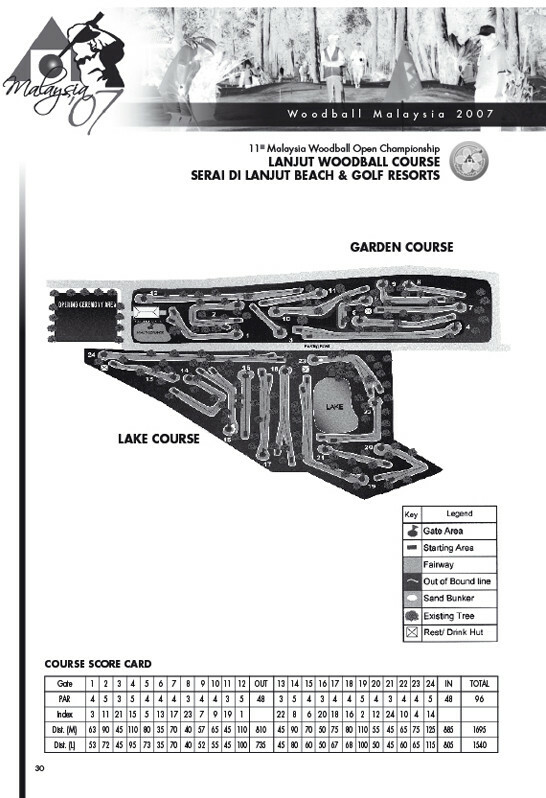 The par rating of each Gate is calculated from the amount of strokes it requires for a ‘professional level’ player to complete the Gate by tee-ing off, playing through the fairway and finishing at the green. 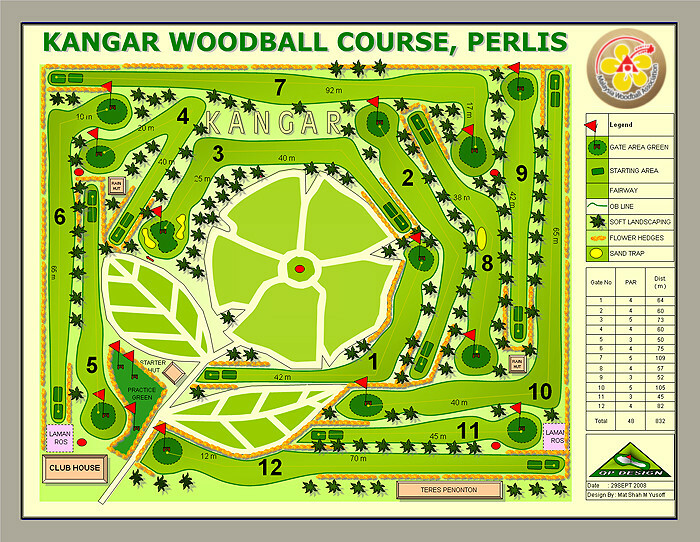 A Woodball Course is made up of 12 Gates. International Championship Competition standard requires playing over two (2) numbers of 12 Gate Courses, i.e. 24 Gates. Generally each course covers a total distance between 700 metres to 900 metres depending on design. 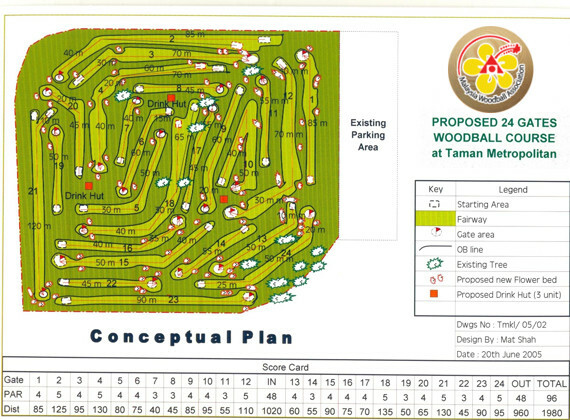 It consists of 4 no.s Par 3’s, 4 no.s Par 4’s and 4 no.s Par 5’s making a 48 Par Stroke 12 Gate Course. The 8 acres course is characterised by well manicured lawns (serangoon grass) and smooth 'Greens'. The Garden Course rewards players who are accurate with short strokes while long hitters will be thrilled with the Lake Course. Accurate reading of `line of play' will result in much better scores. 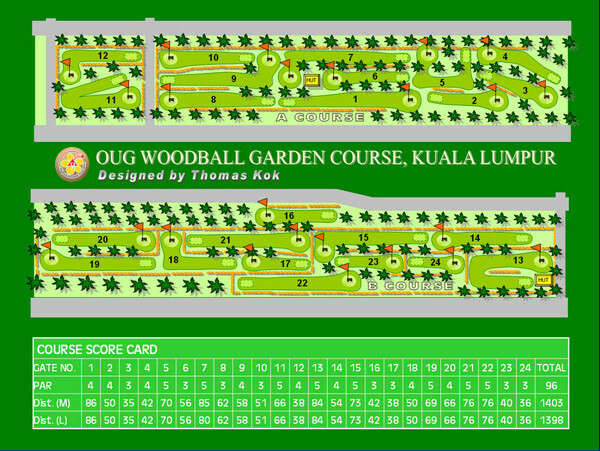 The OUG Woodball Course was built in 1996 over a DBKL road reserved. 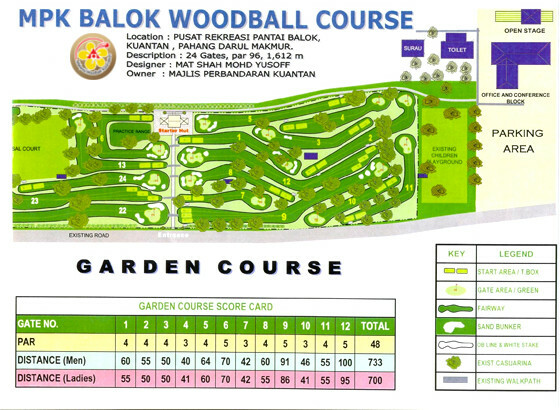 It was the first woodball course in Malaysia and was designed by Thomas Kok, the founding president of Malaysia Woodball Association. The construction of the course was carried out by Mr Kok and members of the club, many of whom are residents in the area. The course is challenging with narrow and fast fairways. It was upgraded in 2002 with an extension that was designed by James Ng. 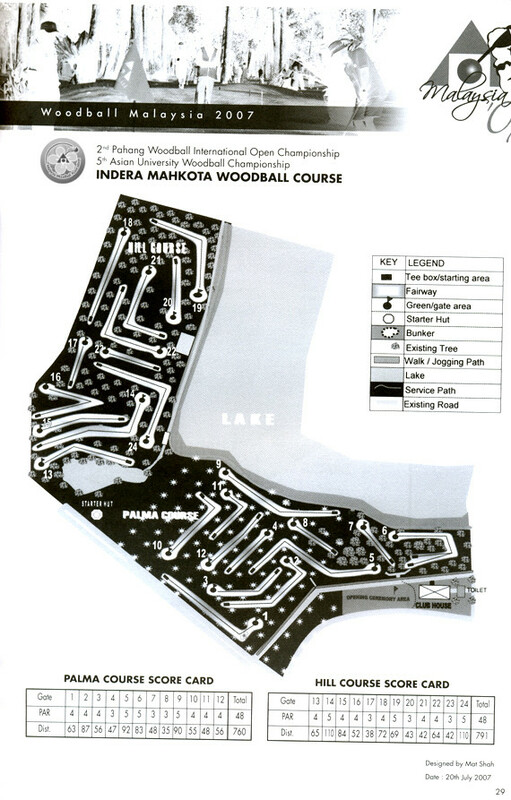 The course has been the venue for many international championship since 1996.